COLUMBIA, Mo 8/21/15 (Op Ed) -- The Boone County Commission's recent decisions to move Confederate Rock and the Ichthus-bearing Desert Storm memorial off county property raises an important question: Why does the name "Roger B. Wilson" remain on the county government building? 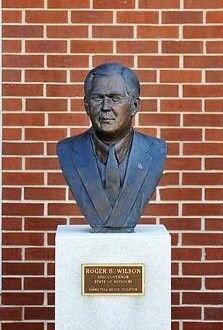 Complete with a bronze bust of the lifelong Missouri politician, the Roger B. Wilson Boone County Government Center violates a common-sense principle -- never name something for a living person. If they're not dead, they can still disgrace whatever bears their name. Recent local examples include an endowed Mizzou economics department chair named for failed Enron CEO Ken Lay; and Paige Laurie Arena, the Mizzou sports center named for the Wal-Mart heiress caught in a college cheating scandal. The Roger B. Wilson Building screams partisanship, too, sending a message that county government does not represent everyone. Wilson is Boone County's most prominent Democrat, and a highly partisan one at that. With its surging population, Boone County has more Republicans, Libertarians, Independents, Greens, and other important constituencies than ever before. Most egregiously, Wilson pleaded guilty to money laundering in 2012. The St. Louis Post-Dispatch described the Federal charges as "a scheme to secretly funnel money from a state-created insurer" -- Missouri Employer's Mutual (MEM), where Wilson was CEO -- "to the Missouri Democratic Party." There's that partisanship I was talking about. In cahoots with Wilson, St. Louis attorney Ed Griesedieck donated roughly $8,000 to state Democrats, sending MEM bogus legal bills to reimburse himself. Wilson approved and MEM paid the bills. A Federal grand jury indicted Wilson, who faced federal prison time and a $100,000 fine. The Missouri Ethics Commission went easier on him, fining Wilson $2,000. After pleading guilty to money laundering, Wilson received two years probation. And though Boone County Commissioners discussed removing his name from the county government building, they dropped the idea. "Boone County mum on possible name change at Wilson Building," the Post-Dispatch reported in 2012. The decision to leave Wilson's name in place keeps with the divine right of kings (and queens) that has long ruled county governance. The First Rule of Boone County politics is that to succeed over the long haul -- decades, a lifetime even -- you must at least call yourself a Democrat. The Tax Assessor; the County Commissioners; the Tax Collector; the Treasurer; the Recorder of Deeds; the County Clerk; the Auditor: for decades, the majority have called themselves Democrats. I say "called themselves Democrats" because a real Democrat -- a true believer type, say in the Bernie Sanders mold -- would not let Boone County's richest citizens pay the least amount of property taxes possible, as Assessor Tom Schauwecker (D) has done for the nearly three decades he has held office. True-believing Democrats would not spend over $14 million feathering their own office nests, as County Commissioners did with a controversial office space expansion tax in 2006. Real Democrats would spend that money on social services, a point of contention with the only true-believing Democrat to hold a Commission seat in years -- Northern District Commissioner Skip Elkin, who urged the money instead be spent on mental health care; and sought, over considerable resistance from his fellow public servants, to give beleaguered taxpayers a break. True-believing Democrats would not be the hand-maidens of Wal-Mart billionaires Bill and Nancy Laurie, who own most of the land around the county fairgrounds. Taxpayer support for the "now-it's-shuttered, now-it's-not" Boone doggle could be key to the success of a defunct subdivision the Lauries bought out of foreclosure next door. County Commissioners have been working overtime on a tax to fund the Fairgrounds, defeated last year and sure to return. Ironically, Wilson has joined them in the latest "save the fairgrounds by getting somebody else to pay the bills" effort. But then, true-believing Democrats wouldn't have paid millions for the Fairgrounds in the first place. And true-believing Democrats would think twice about leaving the name of a crony capitalist -- Roger B. Wilson -- on a government building. The true-believing Democrats I know are smart enough to see the hypocrisy of saying "Confederate Rock must go; the Ichthus must go; but Wilson the money-launderer -- he stays." You are here: Home Boone County WHY IS ROGER B. WILSON'S NAME: Still on the Boone County government building?